How Do You Solve an Equation by Guessing and Checking? 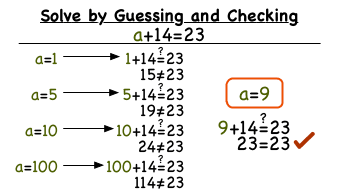 Want to solve an equation by guessing and checking possible answers? Then this tutorial is for you! Make sure to pay close attention to the strategy involved in guessing and checking! What's the Subtraction Property of Equality? Solving equations can be tough, especially if you've forgotten or have trouble understanding the tools at your disposal. One of those tools is the subtraction property of equality, and it lets you subtract the same number from both sides of an equation. Watch the video to see it in action! How Do You Solve an Equation Using Subtraction?